After reading the apologist drivel the News and Observer Editorial Board penned this time, there was no way to stay silent on this controversy. Barber and his traveling show of social justice warriors have made a mockery of the term civil disobedience and have perverted the precepts of religion with their actions. As a taxpaying citizen of this state, I’m sick of seeing their carnival descend on the legislature. I’m also tired of seeing my tax dollars used to arrest this traveling clown show only to be released, charges dropped, and no consequences for their actions. Barber and his ilk have abused the rights of other citizens when they disrupt or scare people away from the legislature with their theatrics. It is the “people’s house,” not his personal laboratory for misfit toys. As such, he owes the people an apology and should be banned. He clearly has plenty of lawyers so they can be his representatives if he needs to do business there. In June, Moral Monday leader and NAACP President, Rev. William Barber, was banned from entering the North Carolina State Legislature building after interfering with business from being conducted. That might take one aback if one did not know the detailed history. William Barber and his rag-tag group of Moral Monday faithful have been interrupting business at the legislature on a regular basis for four years now. Slews of arrests occurred throughout 2013 and into 2014 which reached around 1,000 people. As a point of fact, these arrests were the whole point. To be arrested and steal the headlines of every sympathetic news outlet aligned with BlueprintNC. The arrests are always a planned stunt. The more arrests, the more media. In the trade, they call it ‘earned media.’ That is, the more the media tells their story, the less they have to pay for advertising, etc. Moral Monday protesters were not engaging in spontaneous civil disobedience; they volunteered to be arrested at a pre-protest meeting. Each volunteer typically wears an armband designating their willingness to be arrested. Once arrested, Moral Monday-ites and Barber would wring their hands and complain in court that their arrests were because legislature building rules were ‘too vague‘. Moral Monday is still using the volunteer armbands today. That red tie on the protester’s arm below isn’t a fashion statement. Chanting, yelling, singing, air-horns, clapping in unison and other imaginative ways to disrupt the peace are usual tactics of socially deviant protesters. Activists, often paid to attend these events, have a consistent disruptive behavior. Their childish antics were so disrespectful of other citizens, staff, and the general public in the building that the legislature finally took action. Back in May of 2014, the legislative services commission had had enough of the disruptions to the people’s business and altered the building rules to be more specific. New rules put in place said that anyone who disturbs the General Assembly, specifically by singing or chanting, would be in violation of the building access rules. The new regulations also state that anyone who displays an “imminent threat” of disrupting business is committing a violation. Once the rules changed, Barber threw a fit. The outrage over revised rules at the North Carolina General Assembly is pretty typical of the way the Moral Monday protesters have behaved for the past year. Namely, decry some issue only to complain further when the issue is addressed. When the Moral Monday (or MoMo, for short) began getting arrested on purpose, they complained that the rules they sought to break in order to get arrested were too vague and so they should face no punishment. The purpose of getting arrested was to make a political point and get media attention. The MoMos researched how to get arrested and held instructional meetings to tell people how to get themselves arrested, if they so chose. Once arrested, the MoMos then argued that they should be acquitted because the rules they researched and broke were too vague. Yesterday, the GOP clarified these rules… and the MoMos are mad. This is how Moral Monday works. They protest, staged pre-planned arrests, complain about the arrests, sue taxpayers, complain some more, and then do it all again the following week. Sound familiar? Something like ‘cripple, eviscerate, pressure and slam‘? On May 30th, 2017 Barber and the Moral Monday collective swamped the legislature again. 32 were arrested this time, including Barber, his wife, and his daughter. An impasse reached- they refused to stop chanting and clear the hallways so that other people could do business. Each of them has been charged with second-degree trespassing. Those serial offenders are included in the ban letter. Reverend Barber, Kojo Nantambu, and Ana Maria Blackburn were among those arrested May 30 and listed in the prohibition from the building. All three of them are serial offenders when it comes to being arrested in the legislature building. American Lens has documented a number of these repeat offenders. Here’s the mashup we did of the arrests that took place on December 16th, 2016. Note the multiple mug shots for a good number of those who were arrested. Here is the video montage of the May 30th, 2017 arrests. Again, numerous repeat offenders. Moral Monday is not about raising awareness and their arrests are not acts of moral or righteous indignation. Barber’s brand of religion is an abuse of people’s trust. Barber and his minions warp his unique ideology around a false narrative of “moral” and they do it in the name of God. He is peddling a far left and very progressive brand of partisan politics and doing it on God’s name. He may be wearing ecclesiastical clothing, but he’s doing the work of a stage clown. When anyone else uses religion in a political setting, the media and the Left scream about getting religion out of politics. Reverend Barber and his cracker-jack team of cleric collar wearers get a total pass. Religion used as a political weapon to advance progressive narratives. That’s Barber’s M.O. and our statewide media is fine with it. Heck, they probably are coming up with an editorial to praise and highlight those remarks over at the News and Observer. Moral Monday is nothing but a staged series of social justice outrages. The whole point is to paint Republicans as evil to widen the divide. It’s the Blueprint way. An official letter describing the ban was sent to Barber and his group by Wake County Magistrate Jeffrey L. Godwin. Being banned from the legislature was a condition of their release. Why? Because of the repeat offender business. The disruptions have become a routine nuisance, and it’s become a real issue. General Assembly Police Chief Martin Brock has caught on to the repeat offenders, who are purposefully wasting their time and the taxpayer’s money. Brock said that his department did not ask for the ban measure, but that it makes sense. “If someone has been arrested two or three times, would it be reasonable to expect that they would be arrested again? That would be my observation,” said Chief Brock. “I intend to instruct the officer to ask, especially if the person has been arrested before,” Brock said. Good. It’s well beyond the time the public get a dose of the truth about these professional protesters. Local media hasn’t dug into them, that’s for sure. The media have lapped up Moral Monday like kittens around a saucer of milk. After this past Wednesday’s hearing, District Court Judge Michael J. Dennis upheld parts of the May 30 order barring Barber and the other protesters from the General Assembly building. Barber remains banned. Most of the others were given a reprieve. “Defendant shall not to [sic] return to the North Carolina Legislative Building for the pendency of this action or further order of the undersigned,” Judge Dennis’ order reads. Barber’s lawyer, Geeta Kapur, spoke to media shortly after. “We are going to appeal,” said Kapur. You go ahead and appeal Ms. Kapur – spend your own money, not the people’s. In the meantime, the taxpayer won’t be bilked for a repeat arrest performance from the Dr. Reverend. Maybe we spoke too soon about taxpayers being bilked. 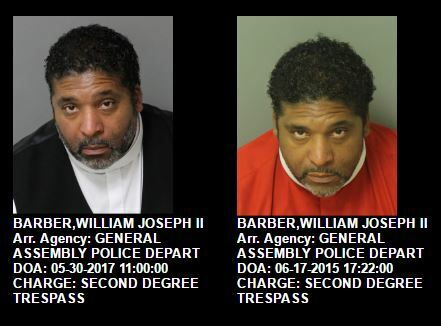 On July 13th, Reverend Barber was arrested again. This time it wasn’t for violating the North Carolina General Assembly building rules. Barber was arrested in the Capitol building in Washington, D.C. Specifically, in front of Senator Mitch McConnell’s office. Barber, and allegedly 50 others he brought with him, were protesting against the Better Care Reconciliation Act, which is a Republican option to replace Obamacare. So Barber took his flock on the road and guess what? More arrests and more media attention. Lather, rinse, repeat. Barber deserves to be banned from the NC General Assembly. He’s not there to do peoples business; he’s there to punish the rest of us. He is not there to talk to legislators nor work on real problems. He’s there to create problems and perpetuate them. Access to “the people’s house” is a privilege, Reverend Barber. A privilege that you’ve abused very purposefully. You made your ban, now lie in it. The opinions, beliefs, and viewpoints expressed in our editorials do not necessarily reflect the opinion of its owners, affiliated organizations, its investors, readers or its advertisers. Our editorial content is the exclusive purview of our editorial staff and safeguarded by a vicious Pretorian Guard. Attempts to influence the staff about your viewpoint is typically met with disdain and will likely be followed by a hand-written note to your parents describing your bad behavior. This article first appeared at American Lens News on July 18, 2017. This entry was posted in Am Lens, BlueprintNC, Moral Monday, NCGA, POLITICS NC, Reverend Barber, THE LEFT and tagged Moral Monday, NCGA, Reverend Barber. Bookmark the permalink.